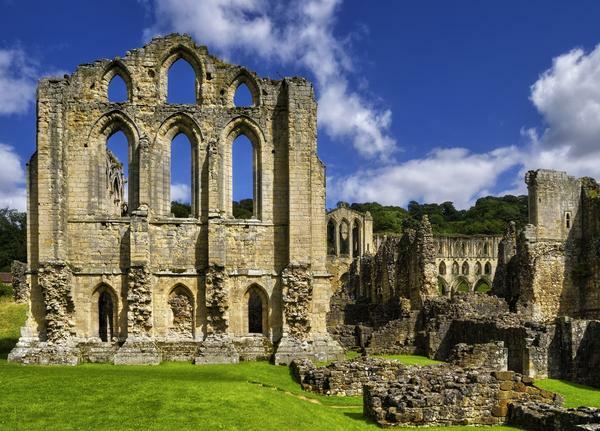 Set in a remote corner of the North Yorkshire Moors, it is easy to see what attracted St Aelred and his twelve Clairvaux monks to establish a monastery here in 1132. 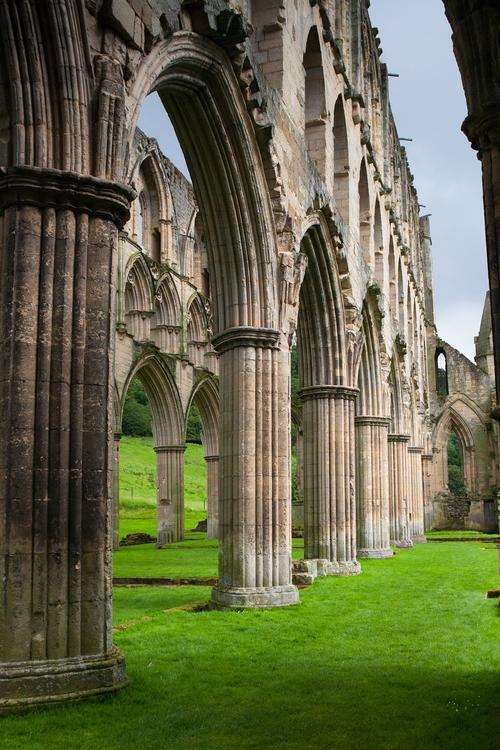 The atmospheric ruins are surrounded by peaceful countryside and have made Rievaulx one of the most popular attractions in the North of England. 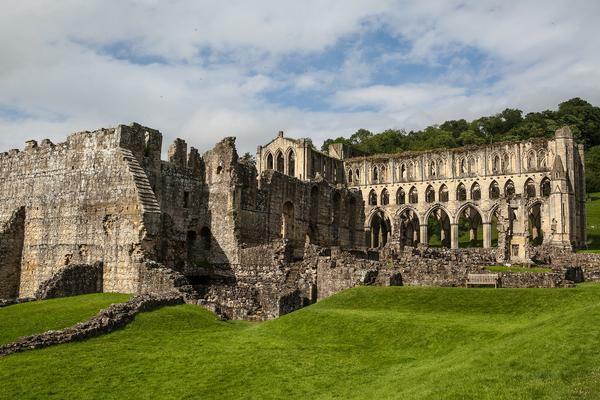 The word "Rievaulx", pronounced "ree-vohl", is said to have been derived from the Norman "Rye Vallis" referring to the wooded valley in which it stands. The River Rye was diverted, but its old course can still be seen, along with the channels dug by the monks centuries ago. A visit to this ruined Cistercian Abbey will reveal how the devoted monks of Rievaulx established a thriving industry which made it one of the wealthiest monasteries in Britain. 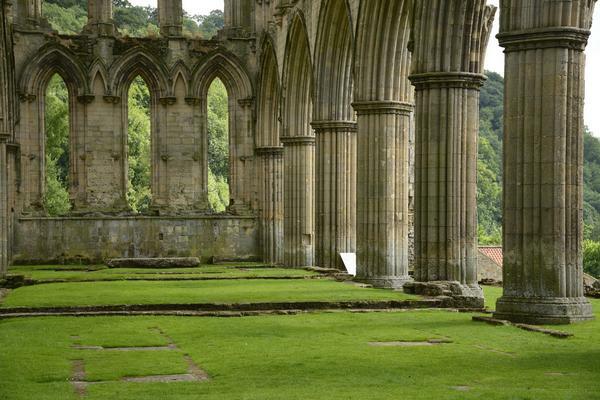 At its zenith, the abbey would have housed 150 monks and 500 lay brethren. It became the mother church of many other abbeys in the area. No doubt the abbey would still be flourishing today but for Henry VIII and his Dissolution of the Monasteries in 1538. The abbey's new owner, the 1st Earl of Rutland, set about the destruction of the abbey buildings, fortunately sparing the ruins still standing today. In the 1750s Thomas Duncombe III decided to beautify the estate by adding two temples, one Ionic and one Tuscan in style which are now part of Rievaulx Terrace and Temples in the gardens. The serene and beautiful ruins retain a wonderful atmosphere. Surrounded by peaceful countryside and inhabited only be sheep, it is a memorable landmark to visit. 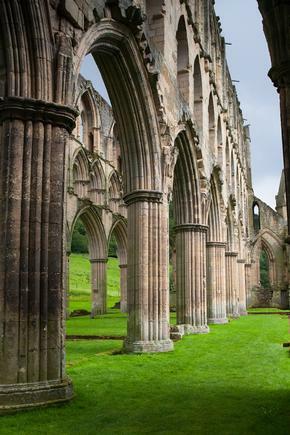 Take the excellent audio tour prepared by English Heritage and discover more about the abbey's 900 years of fascinating history. The 15-acre site has the ruins and footprints of many monastic buildings in various stages of ruin. Some are full height, others are merely foundations. One of the best preserved original buildings is the church presbytery. It has an incredible wall of tiered arches and columns, a testament to early English architecture. The east end of the nave still stands a full three storeys high, thanks to its flying buttresses. 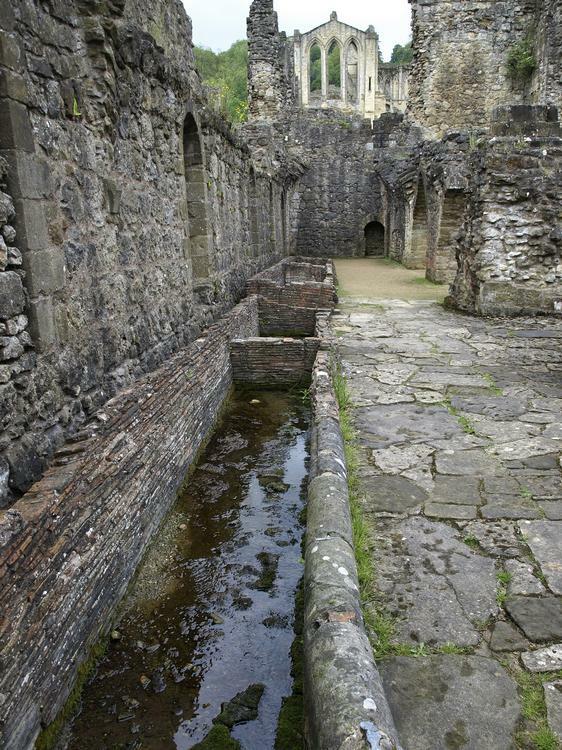 The vast monks' refectory must once have been an impressive dining room. It measures 124 feet long and 50 feet high. Not bad for all-manual labour. Other highlights are the infirmary building and the remains of the cloister. The nave still has the original medieval floor tiles, circa 1300. The arcade and graceful lancet windows give an idea of the abbey's former splendour. Behind the high altar was the shrine to St Aelred who was considered a saint. 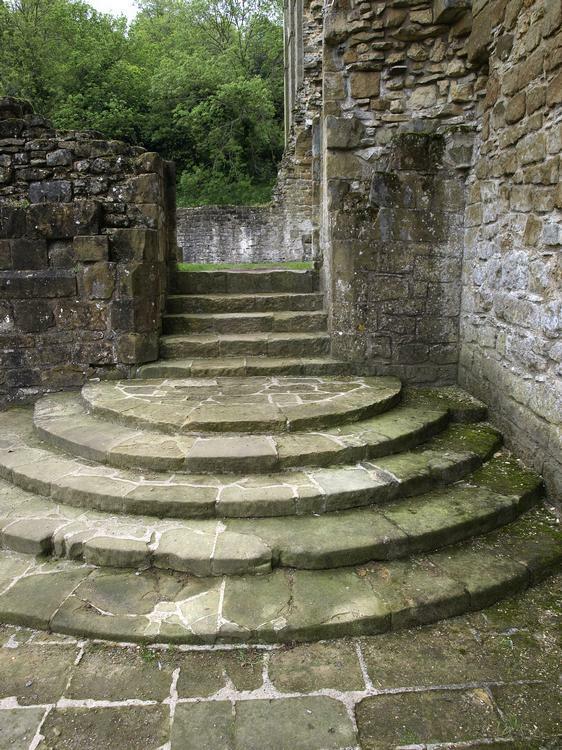 He was a prominent figure in 12th century England and his shrine became a popular place of pilgrimage. The remains of the shrine to his predecessor, Sir William of Rievaulx, can still be seen behind a window of the Chapter House. 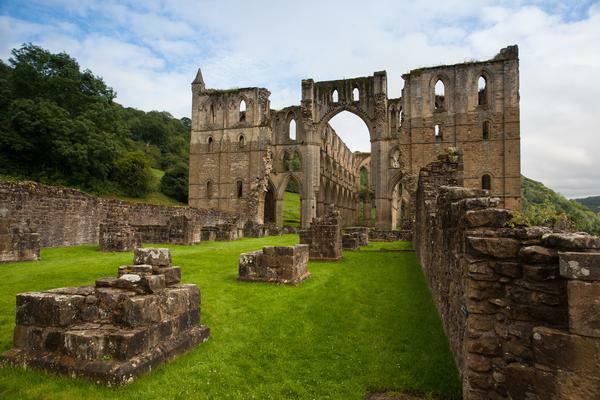 The visitor centre and shop have an indoor exhibition of "The Works of God and Man" showing many aspects of Rievaulx Abbey's history. 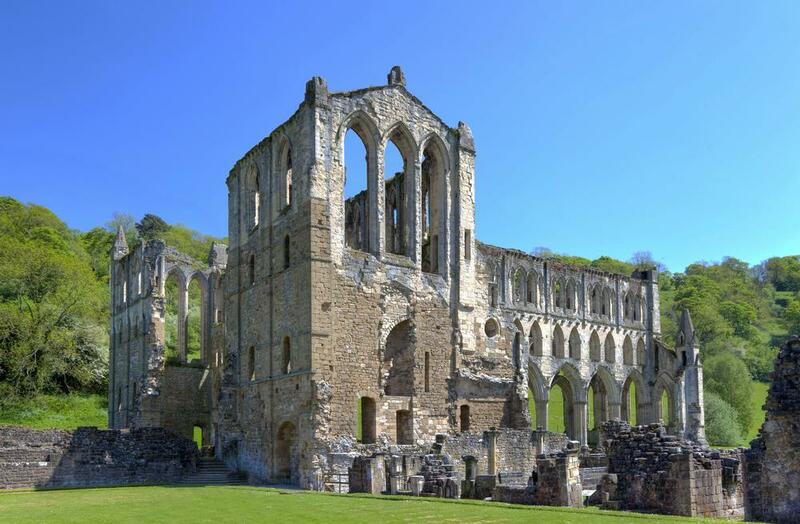 There are also books and special children's trails during the summer making Rievaulx Abbey an ideal family day out. Moorsbus M8, M91 and the Heritage Bus from Helmsley (connections on Scarborough & District 128 from Scarborough railway station) Tue & Thu all year, Mon-Sat June-Sep, Sundays Apr-Oct. Hodgson's Bus Company also run the 199 service to Rievaulx Bank Top operating every Friday from first Friday in October to last Friday in June.